Many people think that Black Mountain in Boulder City is that peak with the bench and informational sign on top where there is an excellent view of Las Vegas and the Spring Mountains beyond. Au contraire! This is Black Mountain Overlook. Today, fourteen hikers set out for a climb to this overlook and a following traverse over to the next higher peak, Black Mountain Peak. 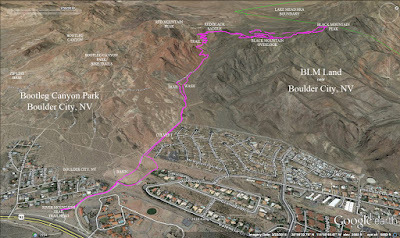 We started from the River Mountains Trail trailhead on Highway 93 in Boulder City, NV just above St. Judes Ranch. 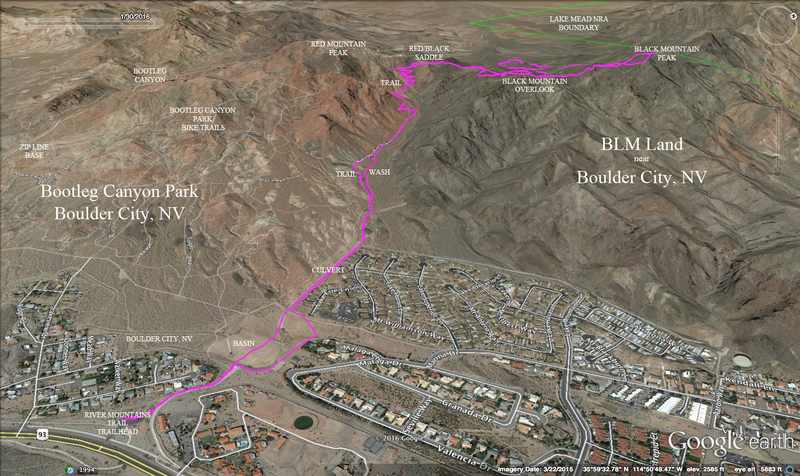 Forgoing the longer route of trail, we chose to get to the meat of the climb via the retention basin trail. Our hike took us up the familiar trail full of switchbacks. We climbed at a moderate pace and, until the end, we stayed together. At the Red / Black Saddle, we stopped for a short break then moved on down and up the Black Mountain Overlook trail. 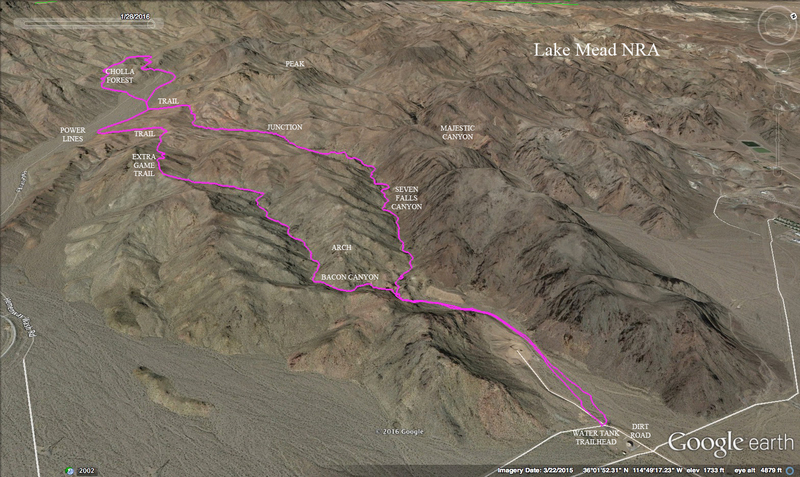 Here, we got separated because there were several different queries going on about the terrain and routes around us. Eventually, we all made it up to the top of the overlook where we shared the space with a group of younger girls. The wind was more pronounced up on the ridges and we needed to don our jackets for the time being. Today's group consisted of eleven women and 3 men. A bit unusual. After enjoying the overlook for a couple of minutes, we started down the other side on a small game trail that is used to traverse the ridge. Three women broke off from the group at this point to make a loop return without going up to the peak. 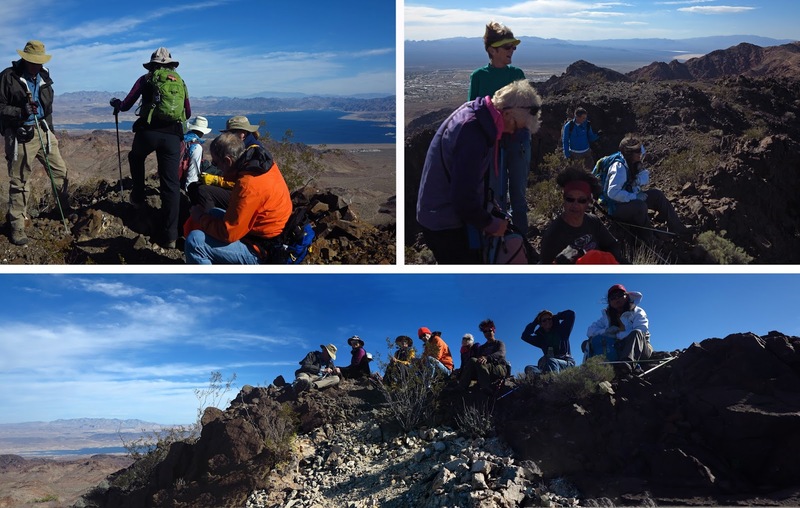 The remaining eleven hikers continued out the ridge, climbed up a steep slope, found another ridge and climbed another slope. 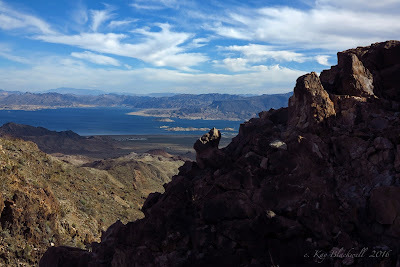 All along the ridge, we had beautiful views of Lake Mead below. The "trail" was not always apparent but the ridge direction is obvious. Precipitous slopes fell on either side of us but we were enjoying the challenge. At one point during the traverse, we climbed over a rock barrier and circled beneath a small arch clinging to the rocks underfoot. The entire traverse required caution and concentration. Finally, we climbed up on top of the approach ridge and made our way easily over to the high point where we signed into the log book. We sat in the mild wind and took our break with views in every direction. We could clearly see River Mountain, Las Vegas, Lake Mead and Red Mountain. It was a beautiful blue sky to the north but it was beginning to be overcast to the south. After the break, we began our drop to the east side of the peak where we passed a geocache hidden under some rocks in a little shelter cave. Not too far down, we came to a saddle. Here is where we began a very steep descent down to the wash below. About a third of the way down, there is a small arch just big enough to hike through. One by one, we did just that and continued down. We gathered in the wash below and started down a fun gentle rocky descent. At the bottom of this particular canyon, there is a nice short dry fall after which is the tent site. The tent is in shambles but there are still jars of something there. It is unlikely that anyone lives here anymore. After this, we continued down the wash until it flattened out and we climbed up on the slope to our left. 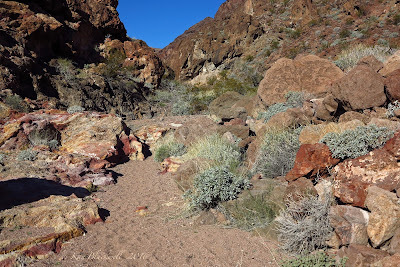 Crossing the Caldera Trail, we bushwhacked over and down into the next canyon wash and started up. By now, we had taken off our windbreakers again. This canyon wash is where a large arch resides not far up on the left. A few hikers went up to the arch for a "look see." Then, a little further up the canyon, we saw that the very tall cairn is still standing. A few hikers added their small rocks to the top of it and we continued up the canyon. Around a point that jutted out from the right, there is a relatively gentle slope up to a saddle area. We decided that this was the best way to get up and take a look. We wanted to find the easiest way to get back to the overlook trail. On the saddle, we saw the twin cairns seen in a photo below. They were standing at the bottom of the hill. We could also see the target trail above on the other side of the canyon. We dropped down the hill to the cairns then considered the best way to reach the trail above. Some hikers went straight up. Some hikers took a diagonal route up to the right. The latter group's route seemed shorter and less steep. From there, we returned to the Red / Black Saddle, descended the switchbacked trail, gave a nod to the bighorn eyes watching us from the ridge above, and hiked back down the wash and culvert then through the basin. We had a great morning in Boulder City! This is the bighorn head that Chuck was trying to find for us yesterday. The photo above was taken previous to our hike to Cholla Forest. Cholla Forest is a large concentration of Teddy Bear Chollas located on a hillside in the Lake Mead NRA not far from Boulder City, NV and the River Mountains Trail. The most interesting way to get to it is up through Seven Falls Canyon. This canyon can be accessed from the water tank located at the end of a dirt road that turns up off of Lakeshore Drive not far from the Boulder City Lake Mead NRA fee booth. Eighteen hikers converged at this trailhead for today's hike. The hike begins by dropping into the nearby wash and hiking up until the canyon begins to narrow. Not far after the canyon has narrowed, there is a fork. The right fork is Seven Falls Canyon. The first dry fall is almost immediate. It can be climbed on either the right or the left. Most of us took the right choice today. The second dry fall comes soon after. Don't be fooled by its appearance. There is a rabbit hole up through there. After emerging from the hole, circle around to your left and rejoin the wash. The next dry fall comes after some hiking and scrambling up the wash. While you hike, take note of the beautiful walls filled with holes. Also, look for bighorns. They love this whole area! One of the next dry falls is, perhaps, the most challenging. The detour is to the right up the side of the wall. 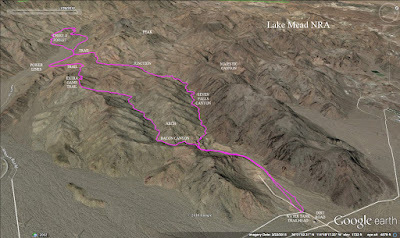 One hiker decided that the detour for the detour was preferable and two more hikers joined her. Three more dry falls ended the challenge. They are difficult as well. But, the up and arounds on the right side of the canyon are just as fun. Give this man a top hat and tails! Soon after the last dry fall, we came to a 4-way junction. The route turns to the left and climbs yet another dry fall area. A short exploration was done on the right side of the wash looking for a previously found bighorn skull. It was gone. Too bad. We could have all enjoyed it. Back in the smaller wash, we continued climbing all the way up to the top where there was a narrow saddle. Just as we arrived, the front hikers caught a glimpse of a bighorn running away in the distance. Game trails crossed our path and we took one of the trails down the other side of the hill. We descended directly into a very wide wash with power poles running perpendicular to our route. We began crossing the wide wash on an angle to reach a canyon that is cut into the opposite side. 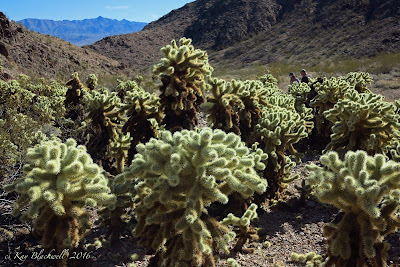 We followed an old road into the canyon and soon we arrived at the Cholla Forest. We sat nearby to take our break and marvel at the opuntias. Few of us dared to walk among the sharp plants. The ground was covered with dropped cholla balls. We didn't want to end up with them all over our shoes like that time that Jerry did! Yes, that story still lives, Jerry! After our break, we continued up the road in the direction we were going before. 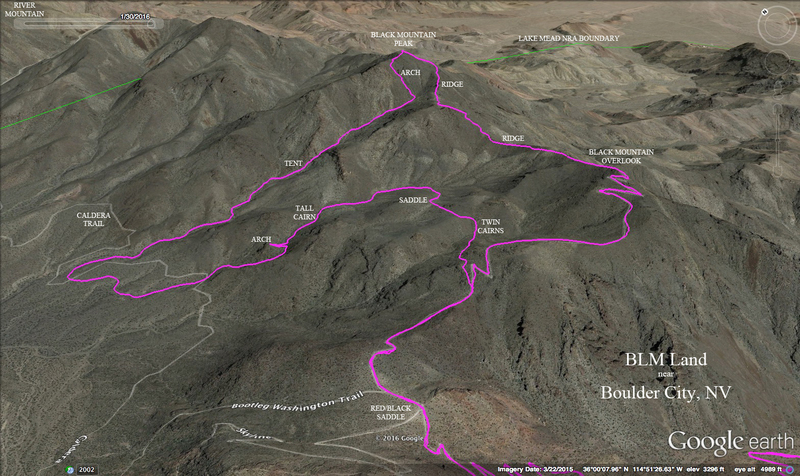 To our left, we passed a side canyon with another cholla forest within. The road led us up a hill to a high point where we gathered to wait for the last hikers. We dropped down the road in front of us and turned right in the wash at the bottom. This is the top of the figure 8 of today's hike. We began our descent by dropping down the wash to our first dry fall drop; a difficult little drop that we all had a different technique for. After we all got down, we continued down the wash staying near the left side of what soon became the wide power pole wash again. 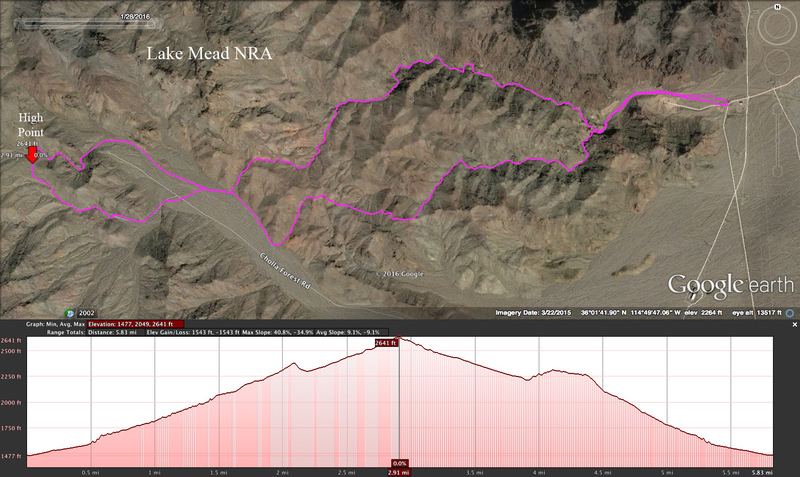 The first indent on the left is the place we came out after taking the game trail down from that saddle. We continued down the wide wash until we circled around a jutting point. On the other side of this point, we turned left. We climbed this bare wash past a very large red rock outcropping. The correct route is to go straight on up the wash.
We caught a trail and found another wash. Here, we angled on a trail to the right. At the top, we found the trail turns to the left on the other side of the hill. We followed this trail in some red dirt until we reached another saddle. Here the trail angles to the right in black rock dirt. The usual route turns down to the wash below fairly soon. We decided to do a little exploring and continued along the game trail that we found to quickly deteriorate. Nevertheless, we followed the trail until an easy descent down to the wash was apparent. 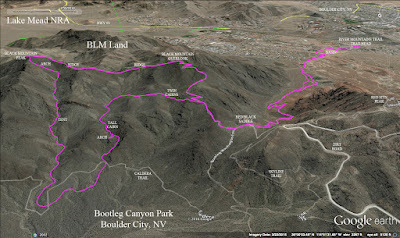 This would be a very nice route if the trail was in better condition. We'll tell the sheep to get right on that. Now in the top of Bacon Canyon, we descended easily while hopping from rock to rock. 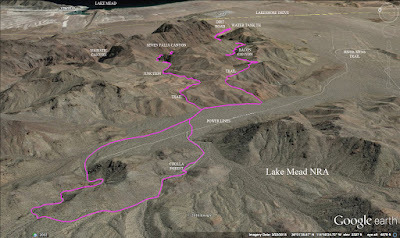 There are a few interesting dry falls to negotiate including one that requires a descent detour to the right. The canyon becomes slightly more precipitous as you get to the end of it. The bacon colors start appearing and things remain interesting. Finally, after the last complex drop, we arrived at the fork where we had turned to begin our hike up Seven Falls Canyon. Then, we retraced our steps down the wash, past the big old shovel and back to the cars at the water tank. 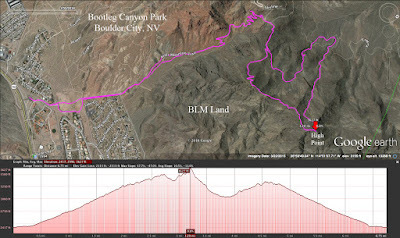 This is a fun hike that will continue as an annual event.